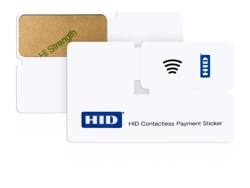 HID Global announced the addition of a mobile sticker format to its family of contactless payment and identification cards. The stickers aim to make it easier to add closed-loop payment and loyalty systems to existing automatic fare collection or retail systems, or to augment campus identification systems with new access control capabilities. They also can be affixed to mobile phones as a bridge to coming NFC mobile payment services. Unlike other stickers, HID’s stickers include an internal ferrite layer that shields electronics from interference even when attached to items containing metal, such as mobile phones. They come in a breakout ID-1 card format and can be printed with customer information including serial numbers, activation codes, messages, brand elements and/or promotional text and artwork. HID Global offers print customization in low quantities, providing companies with an economical way to extend their brand presence. To meet existing customer environments, HID’s contactless payment and identification stickers are available with DESFire, MIFARE and iCLASS technologies, ensuring flexibility. HID Global’s contactless payment and identification stickers are available in both volume and sample quantities. The sticker customization program enables customers to choose from a variety of printing, laser engraving, programming, artwork and contactless chip technology options, upon request. In the field, stickers may be printed with brand elements, custom designs or other information using desktop card printers such as the Fargo line of financial card printers with High Definition Printing technology. The single-use part can be discarded by the end-user after receipt. These solutions will be on display at CARTES & Identification 2010 in Paris, France located in Hall 3, Stand F002 at the Paris Nord Villepinte Exhibition Center from Dec. 7 – 9.